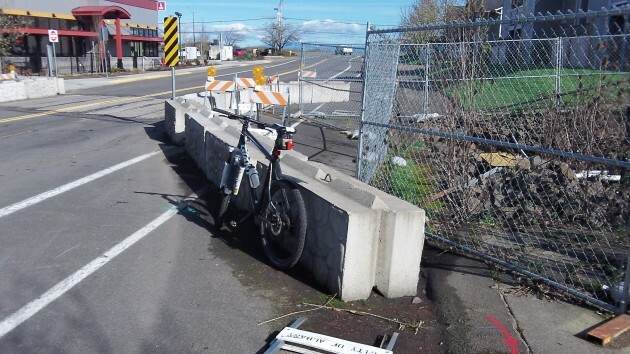 This barrier on Belmont Street in South Albany makes a handy place to lean a bike. It’s also a fine monument to how we have let ourselves become hobbled by essentially needless procedures when the federal government gets involved in construction jobs that may remotely affect fish or rare plants. It was in January 2012 when flooding in the channel under Belmont Street damaged one or both of the old culverts there and undermined the street. Albany Public Works shored up the street enough to reopen it in short order, but complete repairs would take … well, nobody knows how long because they still have not started, though we may be getting close. This was flood damage, so FEMA, the federal disaster response agency, eventually allocated $700,000 to get the street fixed, with Albany paying 25 percent of that. Chris Goins, a young engineer in the city’s Public Works Department, has been working on getting the necessary clearance for getting the job done. The story he tells sounds as though Franz Kafka had written it. Goins says people have been very helpful. But it’s been slow going marked by repeated phone calls and delays. At one point, the city was required to obtain a botanical inventory of possibly endangered plants in the vicinity, including golden paintbrush, Willamette daisy and a certain kind of parsley. The survey was done, and it found nothing to stand in the way of the culvert repair. Time dragged on, with Goins bugging agency representatives to see where things stood, and eventually the Corps was getting ready to issue a permit under a catch-all “biological opinion” known as SLOPES IV. Goins was getting encouraged. His application, the first he had written, had grown to nearly an inch thick and someone had praised it as the best he had seen. But then, alas, SLOPES IV expired and no permit could be issued until its successor was in effect. Goins didn’t want to wait for SLOPES V, so he went back to FEMA. Well, yes, they could issue a permit with the proper documentation, but it would require an individual biological opinion on this project alone. That would take six months if anybody could be found to do the work. Or, FEMA could give the go-ahead if the city could obtain a letter certifying that the project would have no bad environmental effects. This week, Goins contacted ODFW for the magical “no-effect” letter. It’s supposed to establish that during the summer, when the work would be done, there are no fish, endangered or otherwise, in the nearly dry and weed-choked channel underneath Belmont Street. ODFW will send someone to take a closer look. Then, Goins hopes, he’ll get his letter, FEMA will allow him to go ahead, and the project of fixing the culvert can be put out to bid. If and when all goes well, the job will replace the two damaged 48-inch culverts with a three-sided box culvert. It will be 12 feet wide and six feet high, and open at the bottom so that if fish ever do make their way to this spot, they’ll enjoy a natural streambed. The problem is that no one is EVER held accountable in the bureaucracy, this is overreach from government, it should have been temporarily repaired within 48 hours, fixed in two weeks and the final overlay completed that summer. Rich, would these be the permits required by the feds for receiving federal monies?